18 Successful Businesses Started At "The Worst Possible Time"
Southwest battled in the courtroom for years before ever flying its first flight. After reading a lot of entrepreneurs I’ve gotten the feeling that many think they’re lucky. The context they’re often talking about is timing. And timing is a huge thing in business. But I think along with good time also comes the idea of how you look at the opportunity. There are plenty of businesses that seemingly started at the worst time possible. At least by normal assumptions. But if you look at it differently maybe it was a great time. Maybe because it was such a bad time there was less competition. Or maybe going through tough times early makes you feel like you can handle anything. It may seem like a bad time to launch a business. At least in your head. But here are some of the most successful companies ever that started at seemingly horrible times. The Panic of 1907 began in May. Some politicians had been wanting to create the Federal Reserve for years and this was the panic that finally pushed its creation over the edge a few years later in 1913. The panic was deep with a big drop in business activity. That year, though, the company NL Industries decided to get into the paint industry with the launch of Dutch Boy. The brand would go onto become one of the most well known paints among commercial and consumer markets. It’s still a strong brand today. Imagine being part of the NL Industry team. You plan to launch this new brand and all of sudden a panic hits just as you’re launching. It must have felt like the worst possible timing even if the panic lasted just a few months. Harland Sanders had been struggling to find something successful in the business world. He was about 40 years old when in 1930 he bought a gas station and started selling his customers fried chicken. This was right in the middle of the Great Depression. Times were tough. Those that had cars could often usually only afford rations of gasoline for fuel let alone pay for a luxury like friend chicken. But Harland’s recipes were so good that people couldn’t resist. And they kept coming back and eventually Harland was able to buy a larger station and then a restaurant and eventually his brand would go worldwide at Kentucky Friend Chicken or simply KFC. Two hotel entrepreneurs met in 1930, right in the heat of the Depression, to discuss business. They had been competing, but were talking of merging their companies. They felt the merger would help with the ongoing depression as they were able to combine resources and make things more efficient and more appealing to customers. The two added an additional partner shortly after and began adding hotels as money allowed. The brand would go on to become one of the most recognized and respected in the hotel industry. Things sure would be different if these two businessmen hadn’t thought to get together to figure out a way to make it through one of the worst downturns in US economic history. I didn’t realize it, but Sears launched the insurance company, Allstate, in 1931. Sears was one of the most successful companies in the early 20th Century. The idea was to sell insurance through direct mail, which Sears had used to build its empire at the time. The idea worked and even though it was the middle of the Great Depression the company would steadily grow into one that still succeeds today. A husband and wife team received a patent in 1933 for their rubber dustpan. They launched a series of kitchen products under the name Rubbermaid. The company merged with another firm the next year and the brand continues to be one of the strongest today. But if you think back to the timing, it was during the Great Depression. Things would ease a bit from late 1933 and into 1937, but this was a time when consumers weren’t spending much money. But sometimes a strong product will sell well because it offers so much value. And that was the case with Rubbermaid and it thrived during the 30s and 40s and well into the following decades. It was an interesting time in 1945. There was technically a recession throughout the year as the US Government started cutting back on wartime spending. The economy was forced to go through a change and entrepreneurs were forced to shift their focus from government contracts to other areas. It was not a time of business certainty, but some businesses were able to take advantage. A husband and wife team invested $5,000 to create trailers that they would split rental fees with gas station owners to customers that would rent the trailers for use. It was a simple business model that allowed customers to use trailers when they really didn’t need to buy the trailer and the model has remained very much the same ever since. It would seem like a toy company would be a great idea to start heading into the post-war boom. But Mattel actually started as a picture frame company. They also made other furnishings before going into the toy business in 1947 with their first hit, which was a toy ukulele. Sam Walton had been in the retail business for a few years when his lease came up and the store owner denied Sam’s renewal and gave the store to his son. That didn’t deter young Sam, though, as he pushed through with his idea for a discount retailer. The first Walmart launched in mid-1962. It wasn’t the best time for a business launch. The economy had slumped in the previous couple years with lows in early 1961. But offering low prices on products consumers need and want is always a good business model. Walmart has proven to be a good business in all kinds of business environments over the decades since. It can often be a perfect time to launch a business right during or shortly after a downturn. But not everyone is willing to do it. 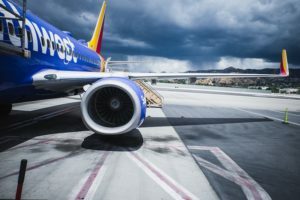 Southwest Airlines was incorporated in 1967, but the founders would spend most of their time battling in the courtroom before they would have their first commercial flight in 1971. And by the time they had that first flight the US was going through a years-long recession. It was a relatively mild recession, but just about everybody thought the airline industry was a bad one to get into. But the founders of Southwest had firm principles of offering the lowest price possible while also focusing on profit over expansion. In the long run, they’ve become one of the most successful airlines in history. There was an oil crisis in 1973 that led to gas shortages and later a stock market crash. It was a rough few years. In the years leading up to this time, the founder of Patagonia clothing had been selling his mountain climbing gear out of his house, cars or wherever he ran into customers. But things eventually worked out for the clothing company even though they have had ups and downs. LP was a spinoff company created when its parent, Georgia-Pacific, had become very large after inventing a different kind of plywood that was cheaper to make and easier to make as well. But the spinoff occurred during the big economic downturn. But as we’ve seen with a few of the companies on this list, when you offer superior value at low prices you can often win out as the competition falls during recessions. Most entrepreneurs fear recessions, but a few welcome them becomes it weeds out the weak and annoying competition. In early 1975 the US was still reeling from the oil crisis recession. It was seemingly not the best time to launch into a brand new field for business, but Bill Gates and Paul Allen had big ideas for their microcomputer software. They officially created Microsoft that year and would go on to become one of the biggest companies in the world as the 1990s hit. Sometimes you just have to be bold enough and believe in what you’re doing no matter the economic condition. Two guys had been home brewing their own beer for a few years when they decided it was time to turn the venture into a business. It wasn’t just risky because there were about three or four beers that had all the marketshare in the US, but craft brewing really wasn’t a thing at the time. Add to that a pretty strong recession that followed in early and mid 1980 and you have a recipe for a business disaster. But the founders persevered and the company has become very respected and successful. The Great Recession officially began in late 2007. That will cover the rest of the companies on this list. I had just left college and got my first job in 2007. Things were seemingly great in the business world, but the real situation would hit home in 2008, 2009 and even in the years that would follow. But some of the most successful companies we know today would rise out of the ashes of that downfall. One of those companies is Zendesk. The company launched in 2007. Things were good. Imagine just getting going with a great business idea and then having the recession hit. But the company was good and they continued to receive funding in 2008 and 2009 and now are one of the most used and respected customer service products in the world. The company was first imagined by Dr. Dre and Jimmy Iovine in 2006. The first product launched in 2008. Not the best time to launch. People were tight with money. The product was relatively expensive. It was a great idea, but it was very risky at the time. But the company stuck it out and continues to be one of the leaders in the headphones market today especially after being acquired by Apple. The two founders of Asana left Facebook in 2008. Right during the peak of the Great Recession. They had an idea for a project management software. But many others had the same idea. It was very competitive. Investment money was tight, but the founders had a solid idea and great development skills and they’ve created one of the most used software applications today. Imagine having an idea where you try to convince people to share their cars with other people. Not just that, but you try to get car owners to give strangers rides around town. It was crazy in 2009. Not many people believed in the idea. And on top of that it was still in the heat of one of the biggest downturns in US history. But Uber was an idea that allowed people to make extra money while saving the riders money and time. The recession was perhaps the best time for this company to launch. People had lost their jobs. Others had to sell their cars. Uber offered a solution to both. Things had settled a bit by 2010, but investors weren’t giving away money like in the late ’90s or mid ’00s. But a few investors believed in what the founders of Instagram were doing. Even if it was just a small bit of what Facebook was already doing. But Instagram quickly caught on. They were eventually bought out by Facebook, but allowed some autonomy and have now become perhaps the most loved social network even above Facebook. It’s never easy to launch a business. During economic downturns, money gets tight. Both from investors and from customers. But sometimes this can work to your favor. There will be downturns in the future. Take advantage of them by looking to launch new businesses. Some of the best companies in history have launched during severe recessions and come out on top in the long run.